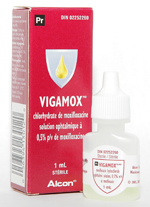 Vigamox ® is a fourth generation fluoroquinolone type of antibiotic. It is usually applied 3 times per day in the affected eye(s), or used for prevention of eye infections after eye surgery. These drops are very effective at treating corneal ulcers (especially those caused by contact lenses) and in this case may be used every 2 hours for the first 2 days of treatment. They usually do not need to be used for more than 2 weeks (barring exceptional circumstances), as they can cause dryness and irritation of the eyes if used for long periods. Zymar ® is a fourth generation fluoroquinolone type of antibiotic. It is usually applied 4 times per day in the affected eye(s), or used for prevention of eye infections after eye surgery. These drops are very effective at treating corneal ulcers (especially those caused by contact lenses) and in this case may be used every 2 hours for the first 2 days of treatment. They usually do not need to be used for more than 2 weeks (barring exceptional circumstances), as they can cause dryness and irritation of the eyes if used for long periods. This is a macrolide type of antiobiotic. It is often used to treat a common and chronic lid infection called blepharitis, or to treat styes (lid pimples) that develop from blepharitis. 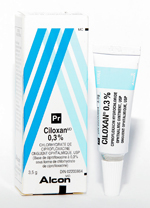 This ointment is applied to the inside of the lower lids of the affected eye(s) every night for 1 week or more. It can be repeated as necessary, however, can cause irritation and dryness to the eyes if used for prolonged periods. This is a third generation fluoroquinolone type of antibiotic. It is often used to treat eye infections, including a common and chronic lid infection called blepharitis, or to treat styes (lid pimples) that develop from blepharitis. This ointment is applied to the inside of the lower lids of the affected eye(s) every night for 1 week or more. It can be repeated as necessary, however, can cause irritation and dryness to the eyes if used for prolonged periods. It is less irritating than Erythromycin. (This also comes in drop form, however the ointment is used preferentially for some infections since this allows better spreading and longer coverage of the medication). 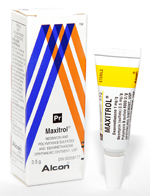 Maxitrol ® is a combination of (dexamethasone) steroid, and Neomycin and Polymyxin B antibiotics. Tobradex ® is a combination of (dexamethasone) steroid and tobramycin antibiotic. This combination is used both to prevent or treat eye infection and to dampen inflammation. It is often used to treat blepharitis, styes (lid pimples), or any lid surgery or other eye procedures. The steroid component can potentially cause the eye pressure to increase if these drugs are used for a long time. They should only be used for the specified amount of time under the guidance of your eye doctor, usually up to 2-3 weeks, applied inside the lower lids either twice daily or at bedtime to the affected eye(s) or as instructed.